View More In Potholders & Oven Mitts - Page 2. A long-time customer favorite. Pull on these 18-inch leather grill gloves when handling a chimney starter full of hot coals or reaching across a hot grill. Soft and pliable for an easy grasp, but long and thick enough to protect your whole arm and hand from the heat. These gloves are not meant for prolonged direct contact to a hot grill grate or hot metal cookware. CARE: Wipe clean with a damp cloth. Hang to dry. Do not machine wash or dry. 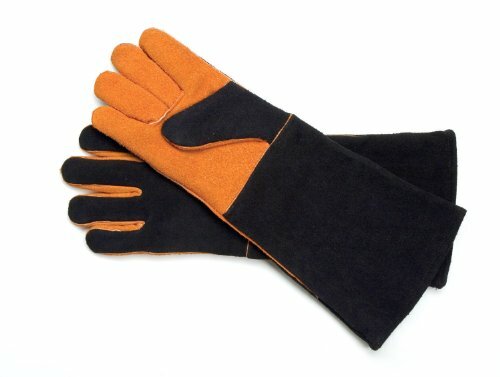 Cook's Illustrated rated these "Highly Recommended" in the Grill Gloves category in 2012 and wrote: "Our winner is protective but thin enough for dexterity, with elbow-length sleeves and wide cuffs that kept us safe and comfortable over the coals. The pliant leather gave us great control when manipulating tongs and grabbing hot grill grates. Long, wide cuffs protected our forearms and let air circulate to keep us cooler over a scorching hot grill. Our only gripe? They’re not machine-washable. If you have any questions about this product by Steven Raichlen Best of Barbecue, contact us by completing and submitting the form below. If you are looking for a specif part number, please include it with your message.